Apple has announced its new Aperture 2.1 with powerful image editing plug-in architecture which allows photographers to easily use specialized third party imaging software right from within Aperture, aiming to enhance the user experience in Apple’s Aperture photo-editing package. If you are dealing with multiple applications running on your desktop frequently, you may need this freeware for your Windows based PC. Named as VirtuaWin, it is an open source application software that able to simulate many desktop system environment without additional hardware installation on your PC. 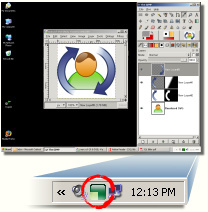 Although there are already many different software utilities such as Windows PowerToy that able to perform similar task, but I found this to be user friendly and yet supports more virtual desktop profiles. Net users especially bloggers and webmasters must be quite familiar with Flickr, a famous and the largest photo sharing website/service and online community platform. When users register for a Flickr account, they can enjoy free monthly uploading of 100MB worth of photos. Showing and sharing favourite or creative photos is a wonderful experience. While showing off your photography technique and skills, you also give others opportunities to appreciate your creations. To upload digital images to Flickr in a more systematic way, you can consider a few uploading tools below. When click on CD writer or DVD writer drive icon or letter in Windows Vista, the optical drive disc tray will automatically eject or open, for users to put in a CD or DVD disc. The CD or DVD drive will also auto eject when users sending files to the CD/DVD writer to burn to disc. When the optical drive is auto ejected or opened, the following dialog appear, asking users to insert a disc into drive. The latest version of free office application suite, OpenOffice.org 2.4, is officially released. This latest office program which is free under the GNU Lesser General Public License shows some new features, enhancements and bug fixes. It is available for downloading and supports numerous operating systems such as Windows, Mac OS X and Linus. Windows Vista SP1 provides much needed improvement, enhancements and bug fixes to Windows Vista since official RTM release in early 2007, such as system startup time, faster file copying operation speed and general improvement to system compatibility, performance and stability. In other word, the first service pack for Windows Vista is a must for all Vista system, and clearly Microsoft does think so too. Although all languages of Windows Vista SP1 has been published to technical personnels such as TechNet and MSDN subscribers, but the releases for general public through Windows Update and Microsoft Download Center have been slow. On March 18, 2008, Microsoft finally published English and other 4 benchmark languages editions of Windows Vista SP1, generally called “Wave 0”, which supports English (US), French, German, Japanese, and Spanish (Traditional). Facing problems and errors while installing Windows Vista SP1? Well, help is on the way. Microsoft will provides free support and technical help for all problems and issues when installing Windows Vista SP1. The unlimited installation and compatibility support is available at no charge until March 18, 2009.